Toyota estimates half of the company’s global sales will be electrified by 2030. “Around 2030, out of the total sales of our vehicles, approximately 50% would be sales coming from electrified vehicles. Electrified vehicles means, electric vehicles (EV), fuel cell vehicles (FCV), hybrids (HEV) and plug-in hybrid (PHEV). Then, in terms of the breakdown, electric vehicle and fuel cell vehicle would total 1m. 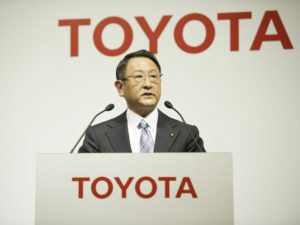 Battery and plug-in hybrid vehicle about 4.5m, so in total about 5.5m electrified vehicles,” said Toyota CEO Akio Toyoda. Toyota states it is and has been working on the development of a full range of “environmentally friendly” vehicles including HEVs, PHEVs, FCVs, and EVs for many years. The announcement follows Toyota’s agreement with battery provider Panasonic, whereby the companies have begun exploring further advancements in automotive batteries for electrified vehicles. Toyoda said that “further evolution, in terms of performance, price, and safety, and the securing of stable supply capacity, are pressing issues” for automotive batteries, which will be met by the cooperation with Panasonic through the study of “next-generation batteries, such as solid-state”, which would include the complete lifecycle, from procurement to reuse and then recycling. So far this year, Toyota has sold 1.47m hybrids and 50,000 plug-in hybrids. “We’re trying to increase this number to 4.5m by 2030. We are going to make a major change in how we navigate our business,” Toyoda added.